Arlington Heights Area Whole House Generators – Call Penco Electric Today! If there is one thing American homeowners have learned from weather disasters such as Katrina, or more recently the floods in Louisiana, is that one can never be too prepared. The safety of your family and the safety of your home depend on taking the right steps before catastrophe strikes. During the past 10 years, the number of power outages due to natural disaster, human error and an overtaxed electrical grid have grown 5-fold according to insideenergy.org. The electric infrastructure in this country is outdated. Most power lines are located above ground and are exposed to high winds, ice storms, accidents and a myriad other calamities that usually always result in a power outage lasting from a few hours to weeks. Every system in your home relies on electricity to operate. Even a battery backup sump pump will only run a few hours before it runs out of charge and unless you find another source of power, your basement will most likely flood – an-all-too common occurrence in the Chicagoland area. We depend on electricity for heat, air conditioning, refrigeration, lighting, security, entertainment and productivity. Homeowners have a significant investment in their home’s systems and its contents. Doesn’t it make sense to ensure that these systems can continue to function no matter what causes a power outage? All over the country, people are investing in whole house generators to protect their homes and their families from losses due to the next power outage. 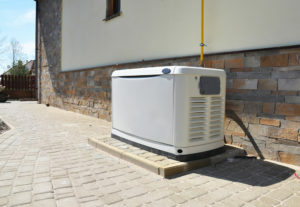 A whole house generator uses abundant fuel sources, natural gas or propane, to create electricity that is fed directly into a home’s electrical panel. Also known as a standby home generator, a generator turns on automatically when it senses that power has been interrupted. Similarly, it shuts off when utility power is restored to your home. Whether you are at home, or away on vacation or at work, your generator stands ready to deliver power to the circuits you specify within seconds of an outage. There are parts of southern Florida that did not get full power restored for almost 3 months after Katrina in 2005. The utilities were only able to deliver power for a few hours each day on a rolling basis to homes and businesses. How would your family and home fare if your power was out for that long? Electricity is often taken for granted. But when disaster strikes, having an uninterruptible supply of electricity providing security for your family and your home is the ultimate home improvement. Give us a call today for a free in home assessment and to discuss how a generator can give you peace of mind. 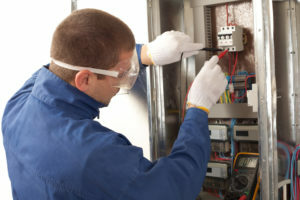 If you are considering a backup home generator for your Chicago area home, then give us a call today. We can walk you through the process as well as do an in home assessment to help you select the right size generator for your home size and family needs. The visit is free, so give us a call today at (847) 423-6662 to find out more about protecting your family and your belongings with a whole house generator.